The BASrouterLX is a high-performance BACnet router providing stand-alone routing between BACnet networks such as BACnet/IP, BACnet Ethernet (ISO 8802-3), and BACnet MS/TP. Besides its high-speed processor, it has advanced features such as MS/TP Backbone, Backward Routing, Whitelist option for enhanced security, MS/TP slave proxy support (allowing auto-discovery of MS/TP slaves) and MS/TP frame capture and storage for use with Wireshark®. As a BBMD, up to 50 BDT and 147 FDR entries can be supported. The BASrouterLX has two physical communication ports – a 10/100 Mbps BACnet/IP Ethernet port and an optically-isolated EIA-485 port for MS/TP. Router configuration is accomplished via web pages. The BASrouterLX is housed in a metal case available as 35-mm DIN-rail mount (BASRTLX-B) or Panel mount (BASRTLX-B/P) model. It is powered from a 24 VAC/VDC (± 10%) source. Its half-wave rectified power supply allows sharing of power with other half-wave devices. There are two ports on the unit – one Ethernet and one EIA-485. 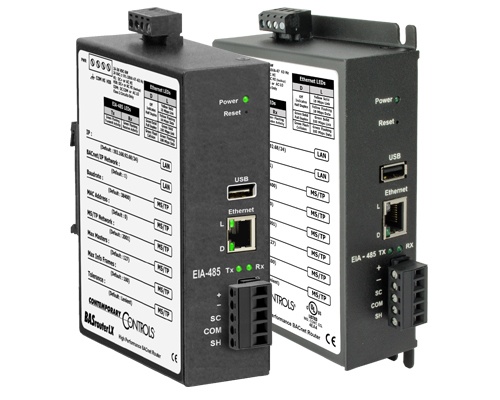 The optically-isolated EIA-485 serial port allows for connection to either 2-wire or 3-wire MS/TP networks using a removable 5-pin terminal block. Up to 31 full-load or 62 half-load EIA-485 devices can share the serial bus at data rates between 9.6 and 115.2 kbps. Internal jumpers provide 120Ω termination and bias. These jumpers can be removed for mid-span installations. The Ethernet port offers a shielded RJ-45 connector. Through auto-negotiation and Auto-MDIX, it automatically matches connections to the attached equipment. Thus, either CAT5 straight-through or crossover cable can be used to attach to the BACnet/IP network at either 10 or 100 Mbps. MS/TP slave devices do not participate in token passing but can be made assessable throughout the complete MS/TP address range using either Manual Slave Address Binding or Automatic Slave Discovery. Once they are known, the BASrouterLX functions as their proxy. A resident web server allows for commissioning, and troubleshooting via a standard web browser. A reset switch is provided on the router to return the unit to the factory default IP and password settings. Five LEDs are provided. The power LED indicates that proper power is being provided. Two Ethernet LEDs indicate link status, data activity, data rate and duplex. Two EIA-485 LEDs indicate transmission and reception of data.